Who would have known about the distinction I had thought only myself could bare the artistic rendition of a thought processes that had unfurled in my own expressive way many others had expressed. Yes I had seen students of science with qualitative formulas tattooed over their body….but it becomes personal when you hold the idea of the Body Canvas to iterate something you believe in. So, for the rest of your life? So for me it didn’t matter anymore, but then I thought how can one remain in anonymity if one helps to identify it’s owner(have I really released previous convictions)? So tattooing for me was more about the way in which your tattoo is depicted, then on how beautiful designs can be relabeled, or new ones drawn and located on. The story for me is truly fascinating and I found it so for those not knowing. 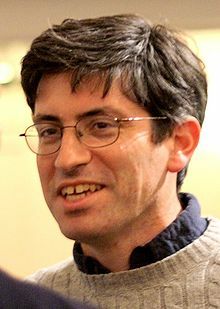 Carl Zimmer (born 1966) is a popular science writer and blogger, especially regarding the study of evolution and parasites. He has written several books and contributes science essays to publications such as The New York Times and Discover. He is a Fellow at Yale University‘s Morse College. Besides his popular science writing, Zimmer also gives frequent lectures, and has been on many radio shows, including National Public Radio‘s Fresh Air and This American Life. His most recent award was a 2007 prize for science communication from the United States National Academy of Sciences, for his wide-ranging and fascinating coverage of biology and evolution in newspapers, magazines and his internet blog “The Loom”. Since 11 November 2009 (episode 35) he is host of the periodic audio podcast Meet the Scientist of the American Society for Microbiology (replacing Merry Buckley). This entry was posted in Books, Projective Geometry, Tattoo. Bookmark the permalink.